Blog | Bartok design Co. Blog – Page 15 – Bartok design Co.
try yourself this ofuro in australia! I hope you are well. 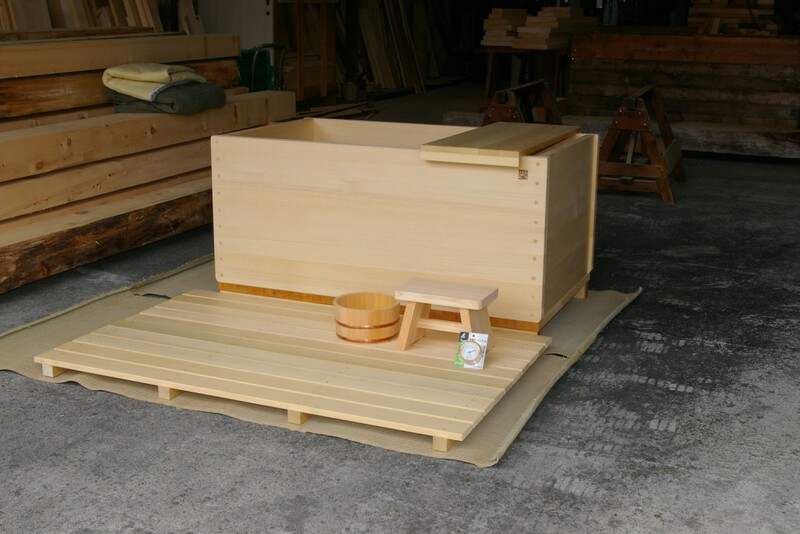 My house is now finished and the Japanese bath looks beautiful. Below is a link to the house. Please pass onto Torrini-San and let him know if he is in Australia he is welcome to stay at my house and experience the tranquility. 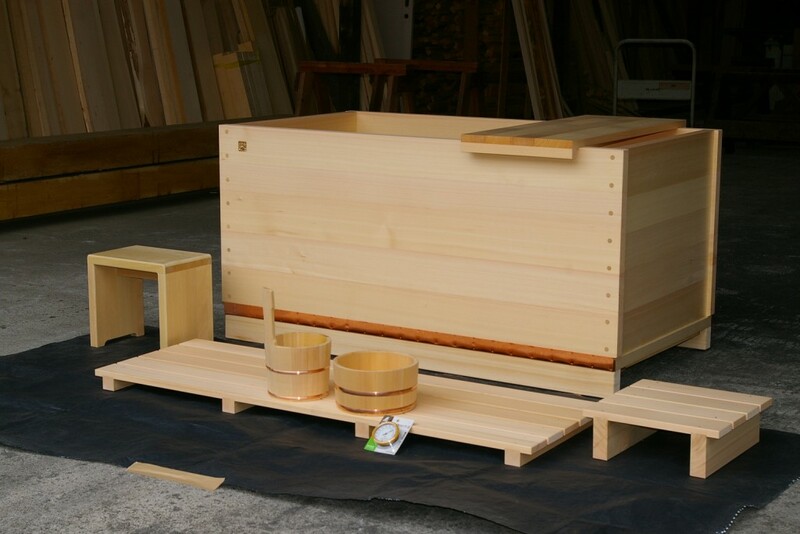 The photo of the japanese tub is superb! Did you use a professional photographer? Also, do you think I can post it in the “testimonials” section of our homepage? It would be great if I can post the link to the accomodation page: I am sure that ofuro lovers in Australia would have a great excuse to stay at your place. Of course I appreciate your kind invitation. I have never been to Australia yet, though it has been on the very top on my list of countries I would like to visit since my childhood! Congratulations for your beautiful house and let`s keep in touch! 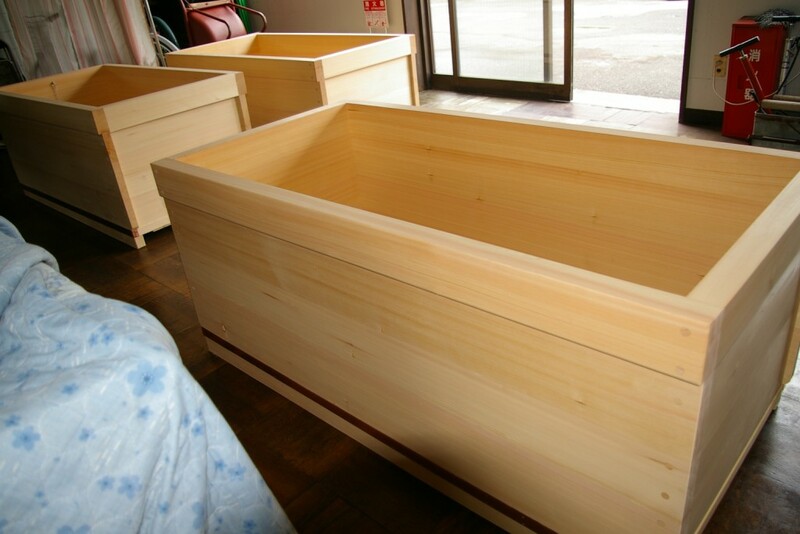 We supplied some alternative quotes for asnaro and hinoki wood. Anyway we could happily catch-up thru my personal gmail account (iax1213 at gmail com). 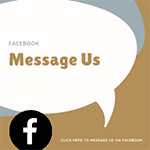 Everybody who has having problems in reaching us: please use the mail above. 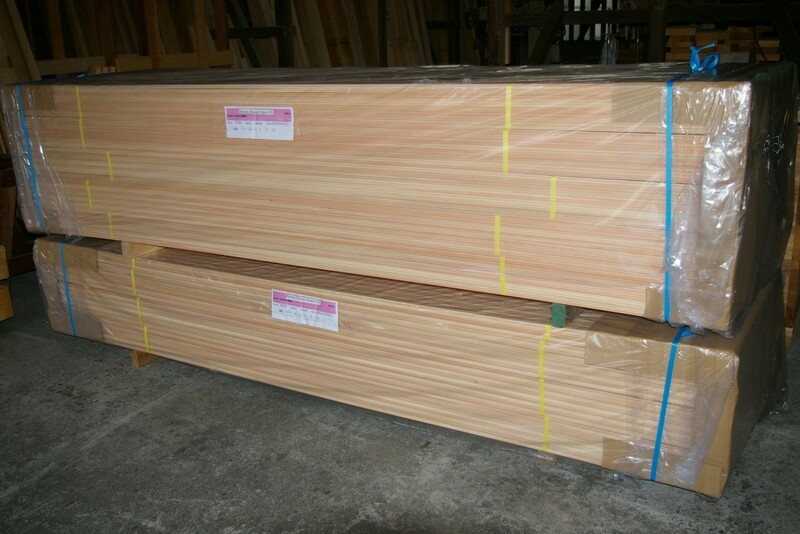 This time we shipped a large quantity of hinoki flooring to indonesia. The planks have a end match joint. We also shipped waterproofing treatment to be applied after installation. 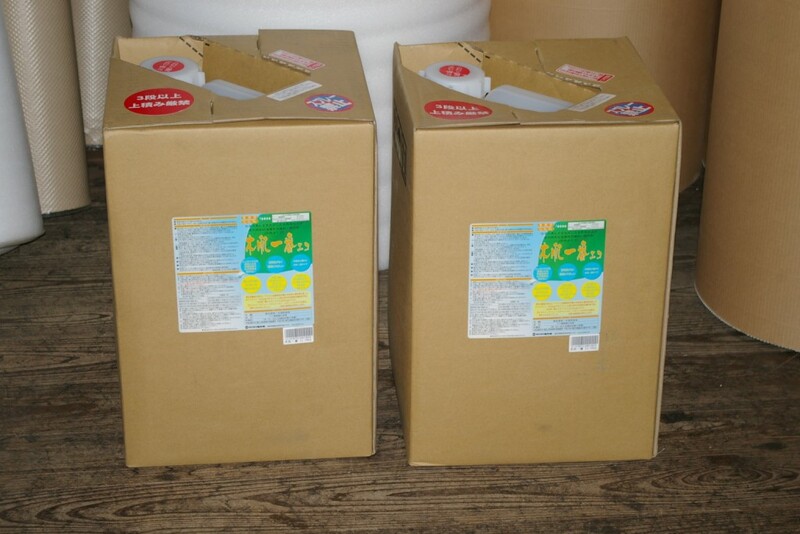 One large can of “kihada ichiban” contains 16Kg and can cover 100m2. The cost is 100,000JPY + packaging + shipping. We also can sell 1L, 4L bins. 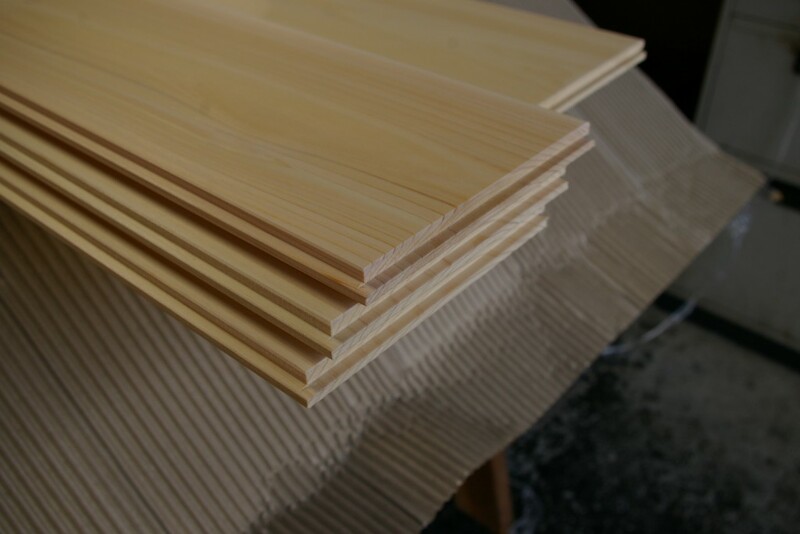 hinoki flooring for your projects! 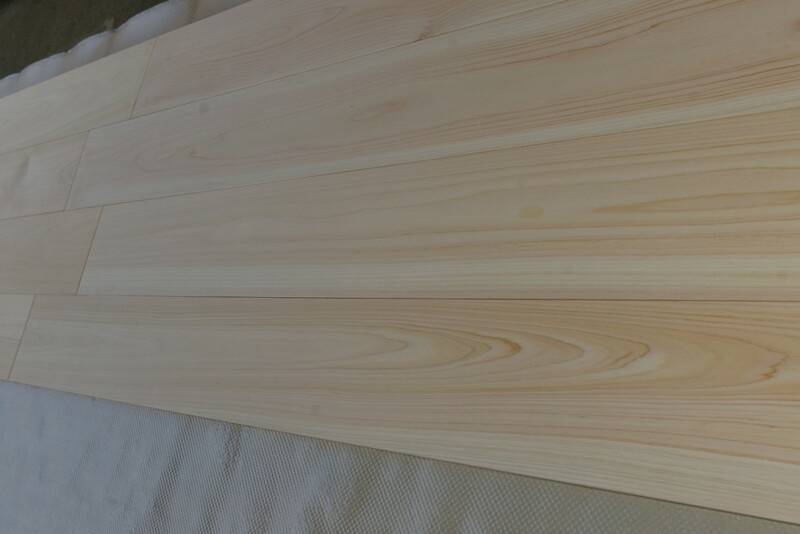 Maybe not all of you know that we can also supply hinoki wood for flooring or wainscoting? 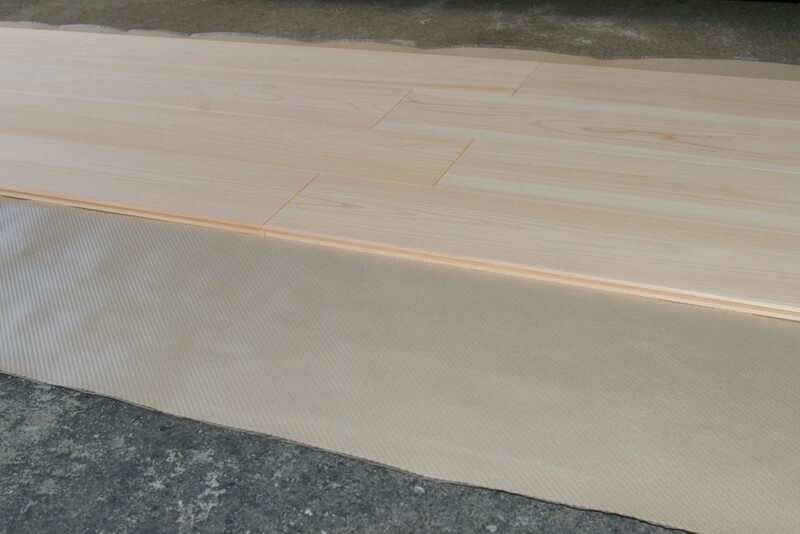 They are very regular and have few knots so we can obtain high quality solid flooring for a reasonable price. 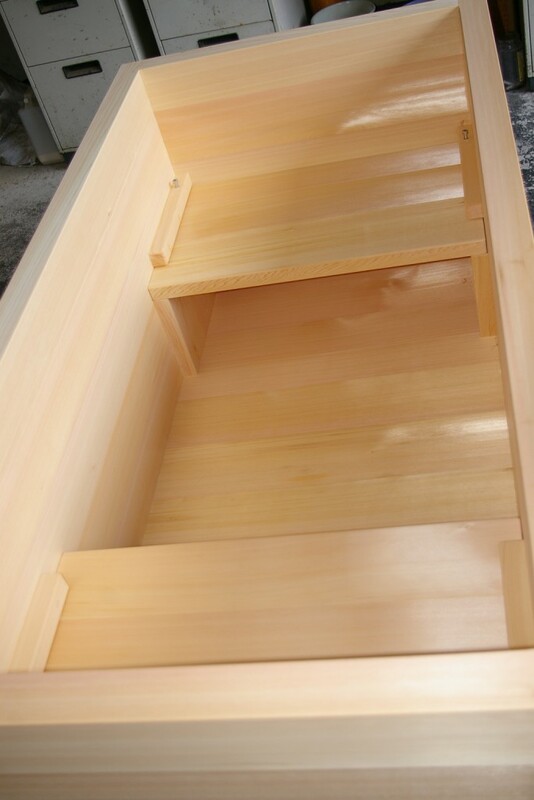 The peculiarity of the material is a mix of “shirata”(sapwood=white) and “akami”(heartwood=red) areas. 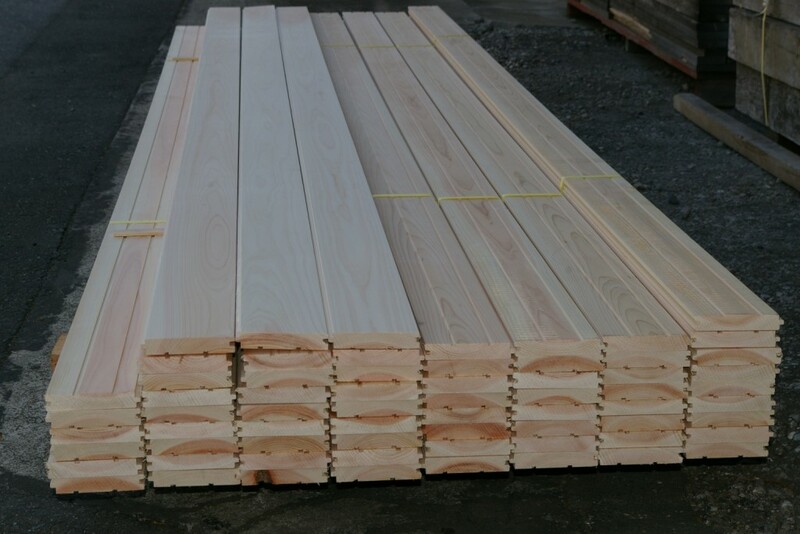 The lumber is cut parallel to one direction (plank cut) so the planks are mixed by nature. 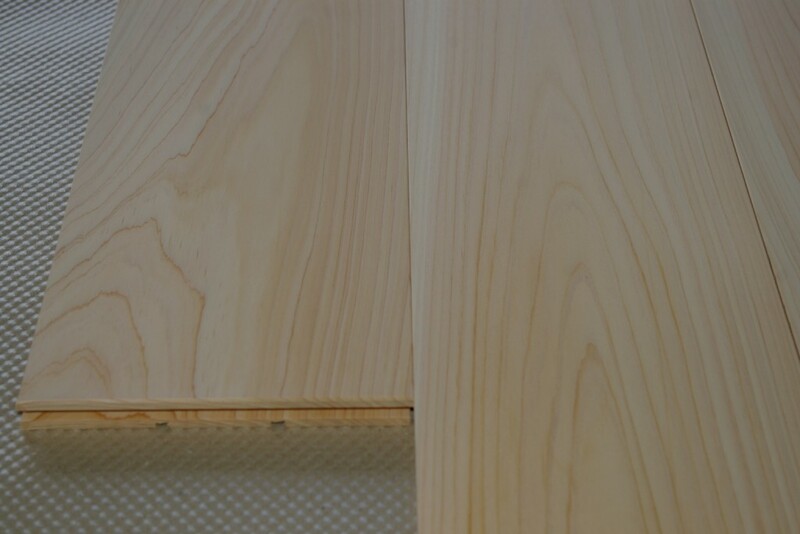 Some people like this look, peculiar of sugi pine and japanese hinoki. 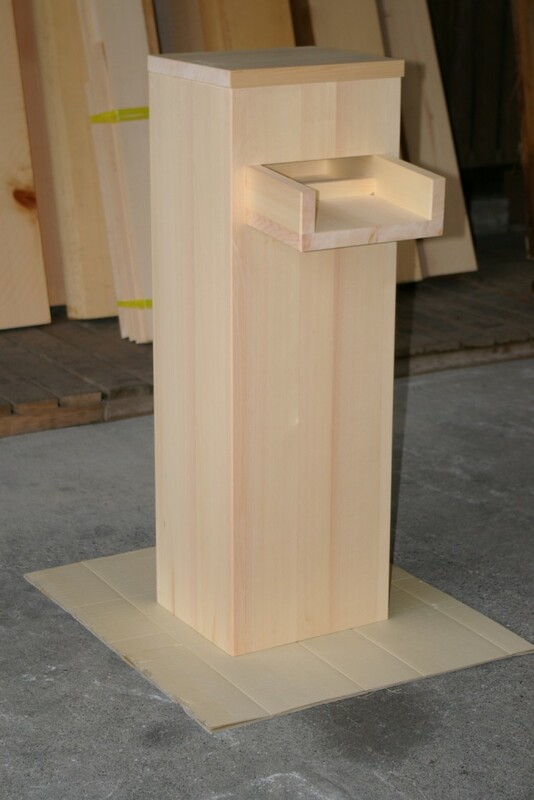 Anyway, if you prefer a more uniform look, the only way to obtain material of the same color is to cut away the sap wood and use only the core of each trunk. This brings up the cost by about 50%. 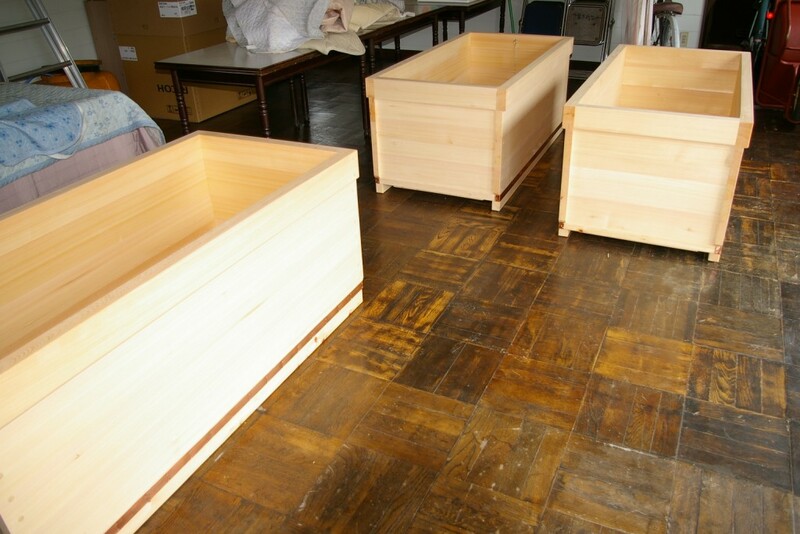 Hinoki flooring is used without shoes and is normally un-coated. It is possible to coat it with urethane but this would interfere with two of the nice features of hinoki flooring: the subtle cedar aroma and the soft/warm touch. To make the upkeep easier, we recommend the application of a full penetration water repellent (Kihada ichiban). The product is applied after installation of the flooring so we will supply separately the cans and you will apply on site with a wide brush in 2 coats. Here is a reference of sizes/prices in case of 12mm thick material. 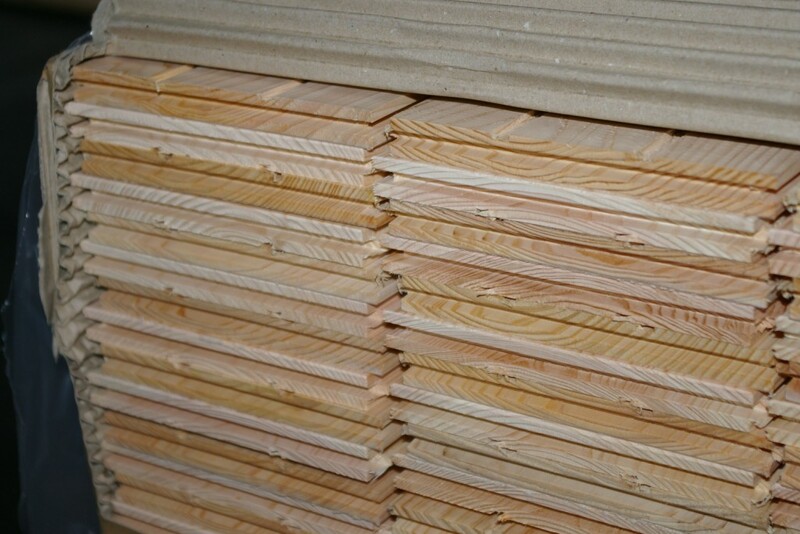 The prices are for a minimum quantity of 50m2 or more. 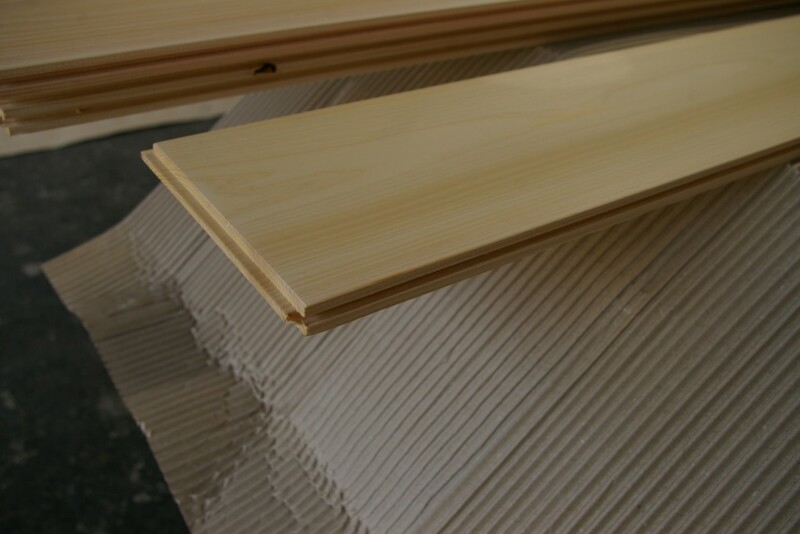 The best cost/performance for a 12mm flooring is obtained by using the 3m planks. For installation use both glue and nails following the procedure as per the sketch here below. Hammer the nails diagonally and make them flush with the aid of a punch before laying down the next plank. Proceed until you reach the other end. 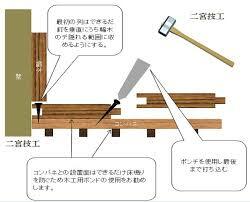 It is recommended to tuck in the planks with the aid of a hammer to make sure there is no gap between the joints. NOTE: Solid hinoki flooring is not compatible with floor heating. 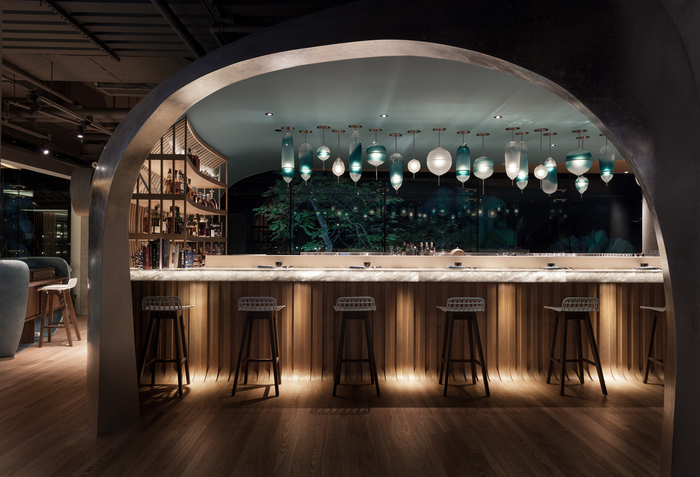 2016 Restaurant & Bar Design Awards! 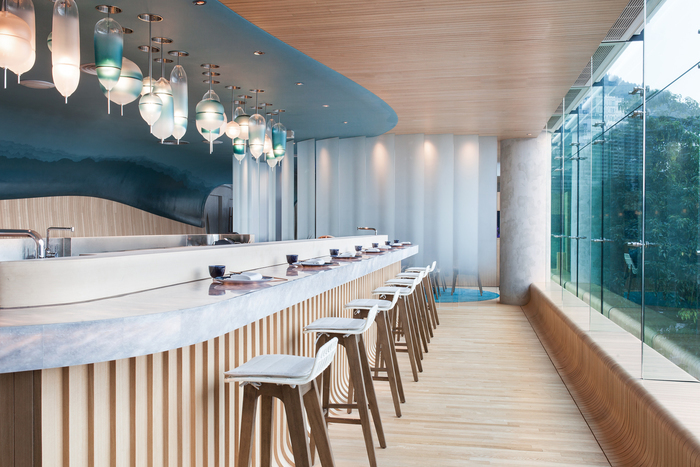 The restaurant and bar The Ocean (Hong Kong, Hong Kong) for which we supplied 8 bathtubs and 2 U-shaped sushi counters has been shortlisted amazingly in two different categories at this years Restaurant & Bar Design Awards. The Restaurant & Bar Design Awards ceremony will be held in London on 29th September 2016. Of course, if you visit Hong Kong do not miss the Ocean! 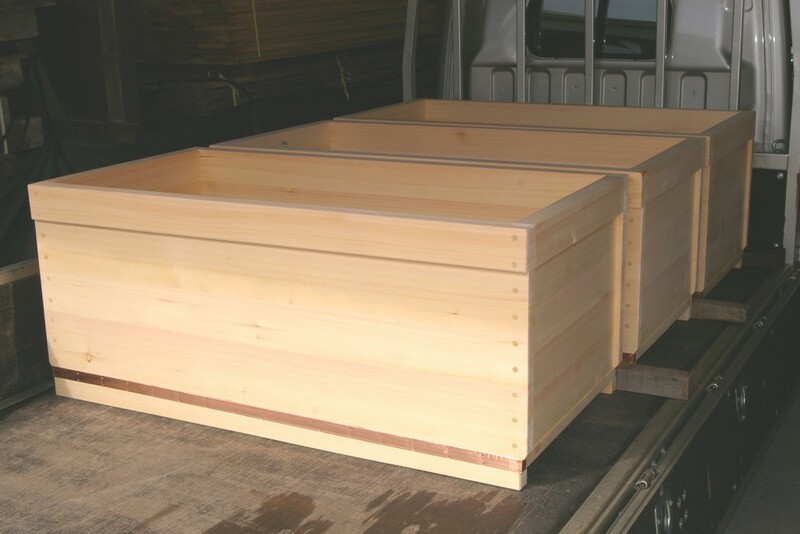 A B2B client just ordered these 3 stunning hinoki tubs. So they asked us to put the tubs in the outlet corner on their behalf. The price was already very competitive as this was a three units order… on top of this the client is willing to offer a huge discount! Please scroll the post to the bottom to see the details. Here below are the specs/price conditions. You can order just one or 2,3 tubs if you want! If interested, contact me promptly at japan*at*bartokdesign.com or by phone to +81-90-8205-1200. You are not familiar with “B-grade”? It stands for wood with small knots. 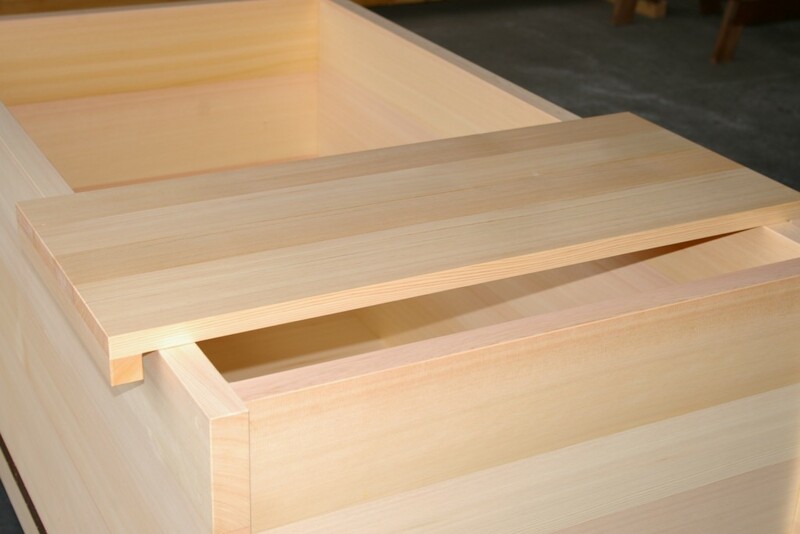 About aroma or durability there is no difference with Hinoki AB grade. The main difference is aesthetic. See some pictures here below. 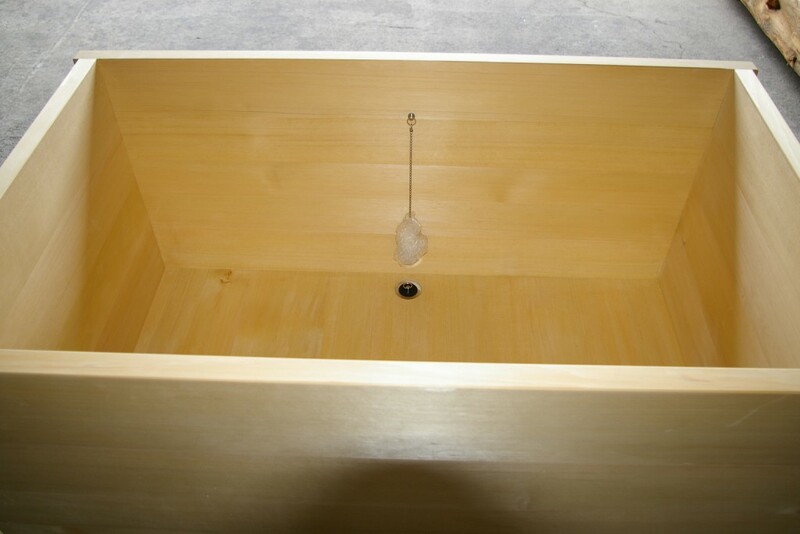 This tub was ordered by an architecture office based in HK for a residential project. 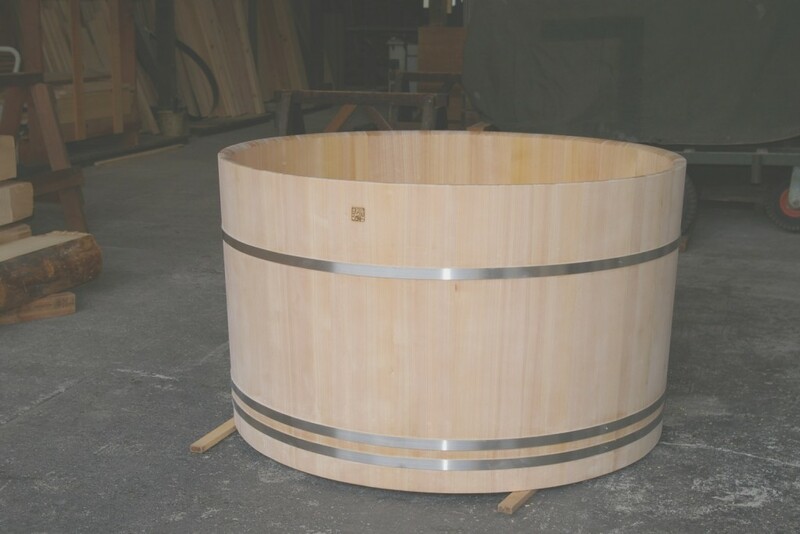 The size was modified from 1400mm to 1200mm and the material from hinoki to sawara cypress to obtain the best cost-performance. Sawara is a japanese cypress, similar to hinoki but slightly more orangeish in color (hinoki is white/pink). It is easy to work with and soft enough so that the metal straps can make a good grip. 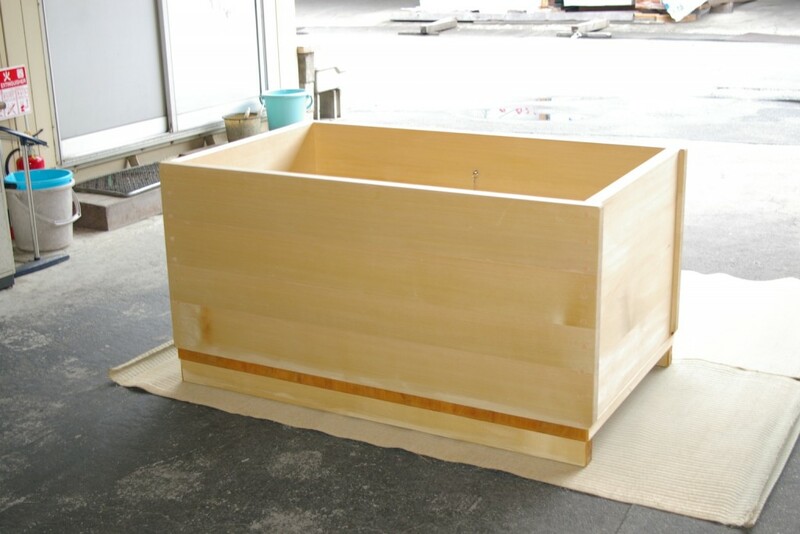 Also, the length of the planks match a Sawara standard so the tub is reasonable with an excellent performance. 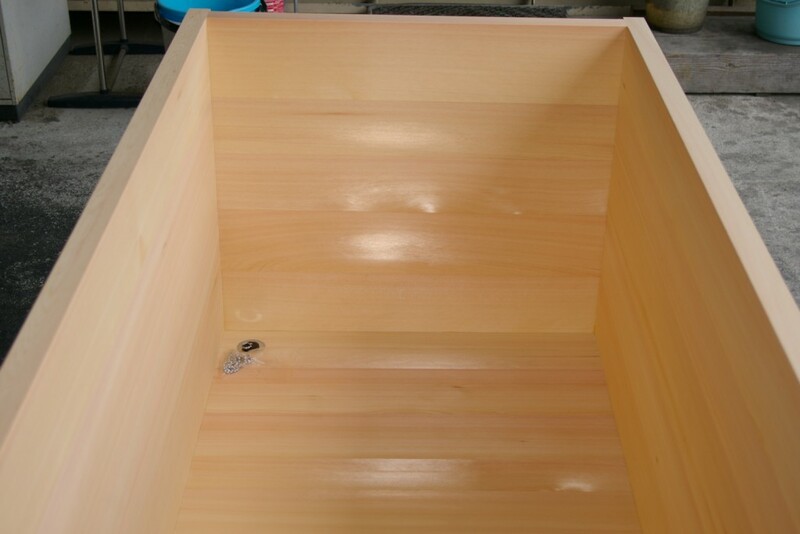 The tub has a bench for 1/3 of the perimeter. The clients visited our warehouse in Chiba in 2014 together with their interior designer. We had several exchanges of mails as their renovation was being implemented. And the result is a luxuriously well proportioned ofuro we are extremely proud of! The spacious interior with 2 removable benches looks like gold as the spotless quarter-sawn hinoki returns the light with warm reflections. Can you imagine it filled with steamy hot water? I am sure that in heaven there is an ofuro like this, as a prize for the chosen ones…! show your passion for bathing on the Japanese TV! I just sent this email below to the mailing list. I am copying here the text for those of you who are not in the list. How are you? It has been few months since the last mailing. Things have been very busy and I did not manage yet to start the “bartok yukata kimonos” collection. Bear with me until september, I will provide updates in the homepage news section so keep an eye on it! Anyway, this mail is about a different topic: I have been contacted by a TV program producer. Are you interested in showing off your love for japan on the japanese TV? Please send me a video (if you prefer you can send it directly to Japan Footage Inc. at the details below). If you are selected… YES! You will be invited to Japan as a guest in the TV program! Check the details in the email here below and/or contact me for any question. I’m Senna Tateyama, from Japan Footage Inc.
Now I’m looking for Japanophiles who want to appear on a Japanese TV program “Who wants to come to Japan 世界ニッポン行きたい人応援団”. (This is the official website: http://www.tv-tokyo.co.jp/nipponikitaihito/ Unfortunately, only Japanese version is available now. 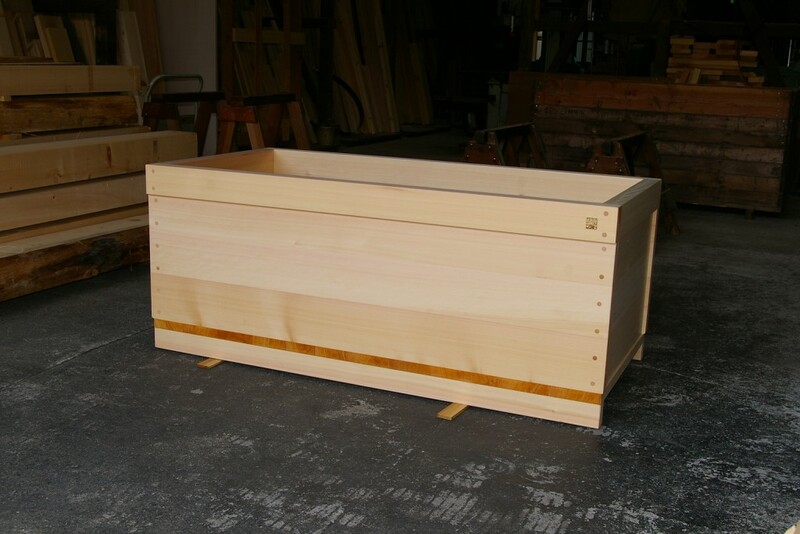 I saw your home page, and was really impressed with your Hinoki Wood Japanese bathtub ! It makes me want to ask you a favor. 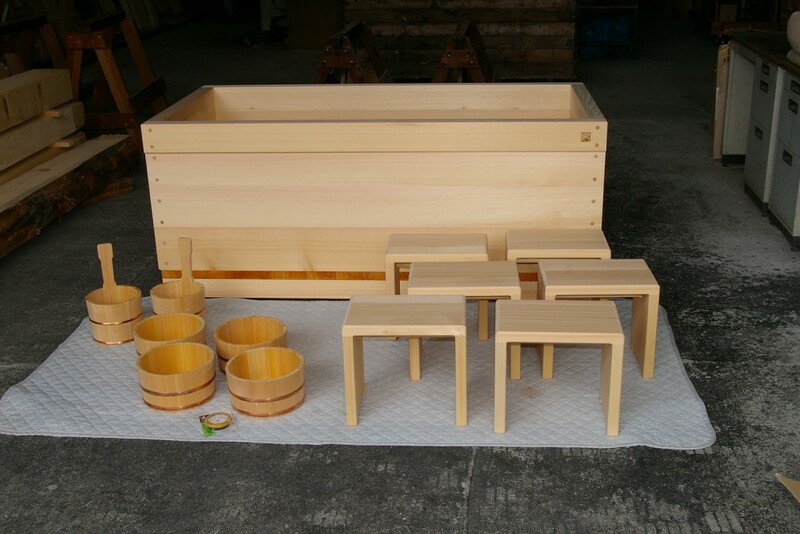 If you know any other non-Japanese Hinoki bathtub lover like you or Hinoki bathtub international networks, could you introduce them to us? Now we are looking for people who have never been to Japan, but with a strong passion to Japanese traditional culture. These are some episodes from our program. 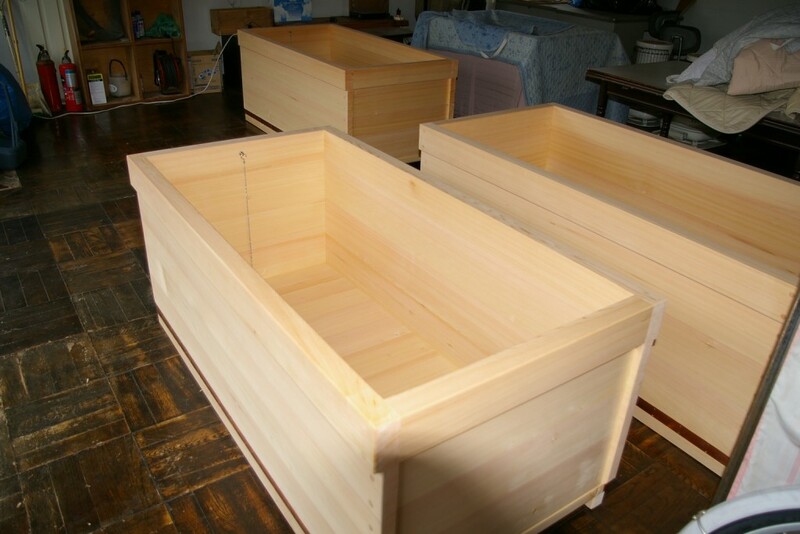 We would like to feature overseas Hinoki bathtub enthusiasts. If you’re interested in this project and have any questions about it, please contact me. We would appreciate it if you could support and cooperate with us! This is an update about the participation to the japanese TV program. I spoke with the TV producer: the clause “has never been to japan” is not a sine-qua-non. What is important to qualify for the participation to the program is the “degree of your passion for japan”. (This was difficult to translate, I hope you can get the message). They are looking for people with a “deeper interest for japan” than the average tourist. Please contact Tateyama-san and describe your passion, they will evaluate if you meet the criteria. 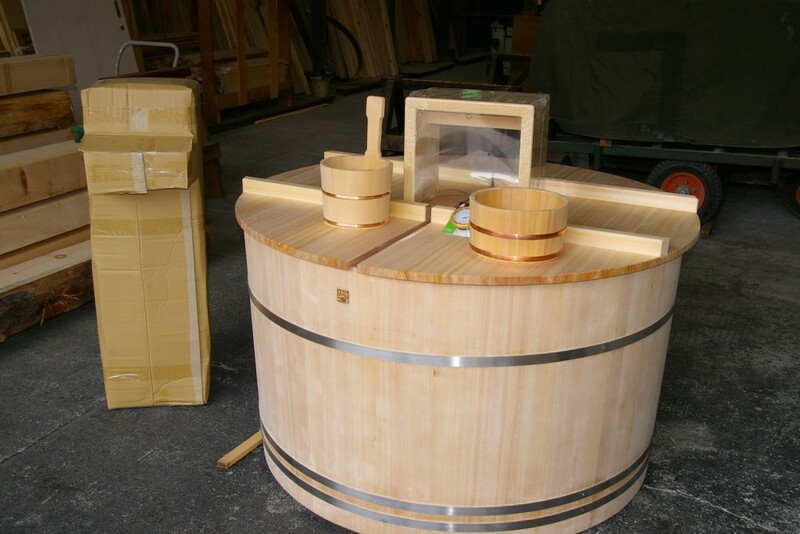 The clients of this ofuro actually visited our showroom in Chiba in november of last year. 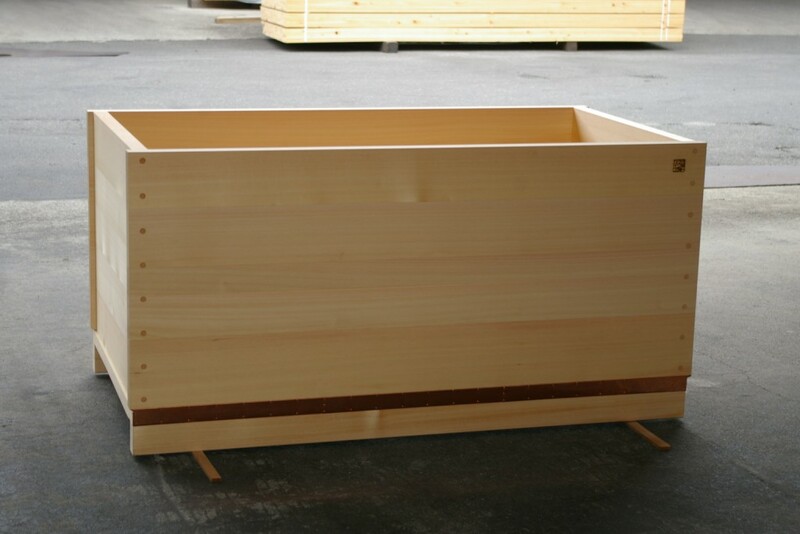 With german-like precision every piece of their plan come together as per scheduled and we are now ready to ship this fragrant bathtub and accessories! We had to supply a smaller drain socket to comply with the local plumbing regulations (limitation on maximum flow capacity). Also, we raised the base under the tub as required by the plumber to make the connection. 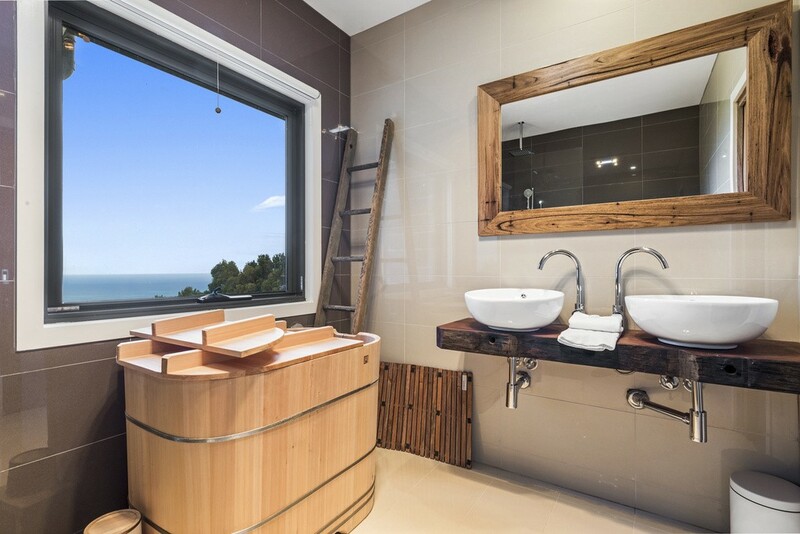 The tub has the Bartok design brand both on front and back (freestanding layout) and is equipped with floor grating, stool, buckets and a step for easy access/egress from the tub. 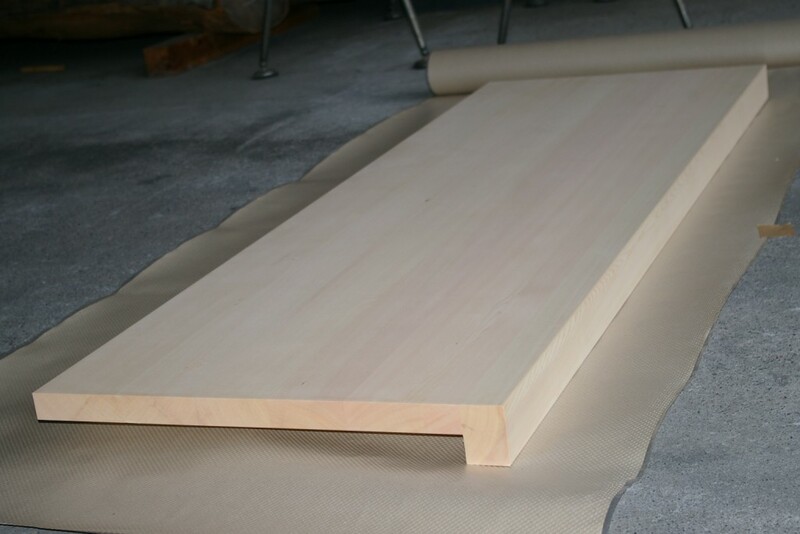 On the client`s requests we also provided a plank that can be used as a table while taking a tub. 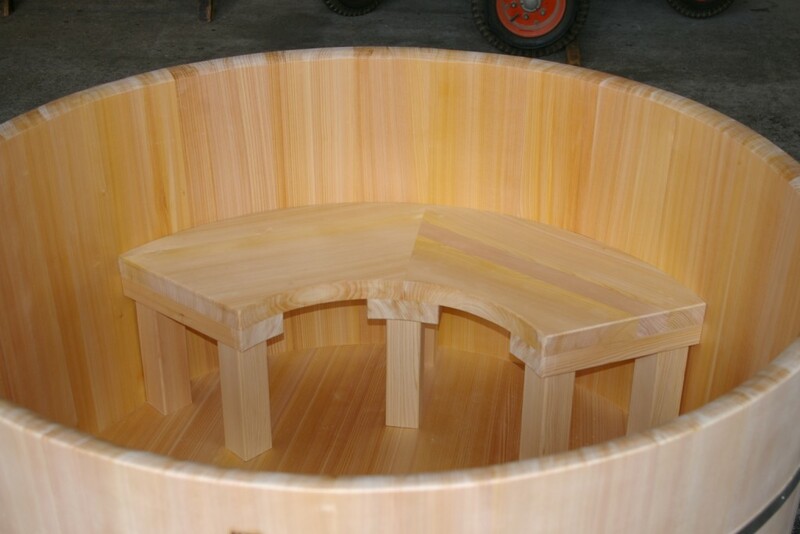 Because the clients are enthusiastic fan of Japan, I am sure they read books on this table, will use it to place their sake cups, maybe even will have their sushi-dinner while soaking in the ofuro! We also provided a coordinated vanity counter (photo here below). They will complement it with faucet and sink: I am looking forward to the pictures of the actual installation!